The latest long-distance bicycle tourist to stop in the Peninsula store yesterday is this guy, with his home-made snowmobile-shaped cargo trailer, weighing in at 75lbs! His name is Dave; although I didn't catch his last name, he said all of his friends and the bike shops in his home of Marquette, Michigan (on the Upper Peninsula) know him as "Super Dave." 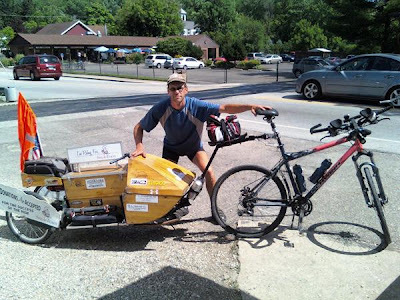 He does a long ride every summer; this year, he's riding through the Midwest, and will proceed through Ohio, Pennsylvania, and New York, and then continue down the East Coast to Florida. He's raising money for The Smile Train, an organization that funds corrective surgery for children afflicted with cleft palate.